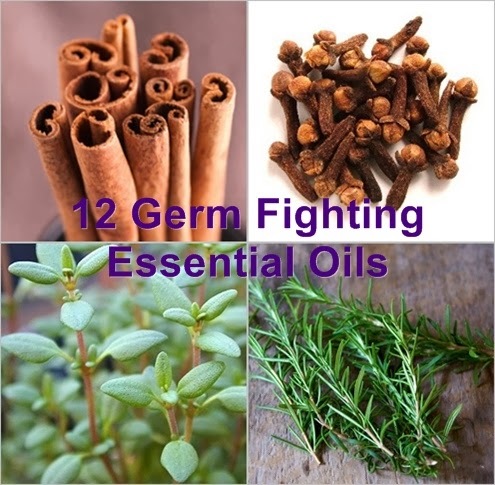 Here's a list of a dozen germ fighting essential oils. They can be used in an aromatherapy diffuser or in a DIY air and surface purifying spray. Non-toxic homekeeping heroine, Annie B. Bond explains how to make a germ-killing disinfecting mist by adding 4-8 drops of essential oils to 1 cup of water. You can spray hard or non-staining soft surfaces with it or mist the air. This makes a wonderful alternative to potentially harmful Lysol products, most of which have significant skin damage, development, and respiratory hazards. A diffuser dispenses the essential oils into the air. Aromatherapist Joan Apter recommends beginning by diffusing oils for 15-30 minutes a day. As you become accustomed to the oils and recognize their effects, you can increase the diffusing time to 1-2 hours. Before using this list, I recommend reading Germs: Understand and protect against bacteria, viruses and infection, just to get clear on the differences between those things. Cinnamon Bark (Cinnamomum verum) is anti-infectious, anti-bacterial, antiparasitic, antiviral and antifungal. Citronella (Cymbopogon nardus) is antiseptic and antibacterial. Clove (Syzgium aromaticum) is one of the most antimicrobial and antiseptic. Eucalyptus (Eucalyptus lemon and eucalyptus radiata) is anti-infectious, antibacterial, antiviral, expectorant and anti-inflammatory. Lavender is anti-bacterial, antiseptic, antiviral, and antifungal. Lemon Oil (citrus limon) is anti-bacterial. Lemongrass (Cymbopogon flixuosus) is highly antifungal. Myrtle (Myrtus communis) is antibacterial, antiseptic, and antifungal. Pine is antibiotic and antiseptic. Rosemary (Rosmarinus officinalis) is antiseptic and antimicrobial. Tea Tree Oil (Melaleuca alternafolia, ericfolia or quinquenervia) is anti-bacterial, antiseptic, antiviral, and antifungal. Thyme oil (Thymus vulgaris) is anti-bacterial, antiseptic, antiviral, and antifungal. Purchase essential oils and diffuser at Mountain Rose Herbs via my affiliate link to earn e-Hugs! Consider supporting this blog by shopping via my Amazon shop. Thanks. OMG! that sounds so amazing! I'm going to share your comment on my Facebook page so everyone know about it. thanks! WIWW: Hot Pink, Hot Dog & Hot Phone Bill Savings! WIWW: Yay for Bobby Pins & Patterns!